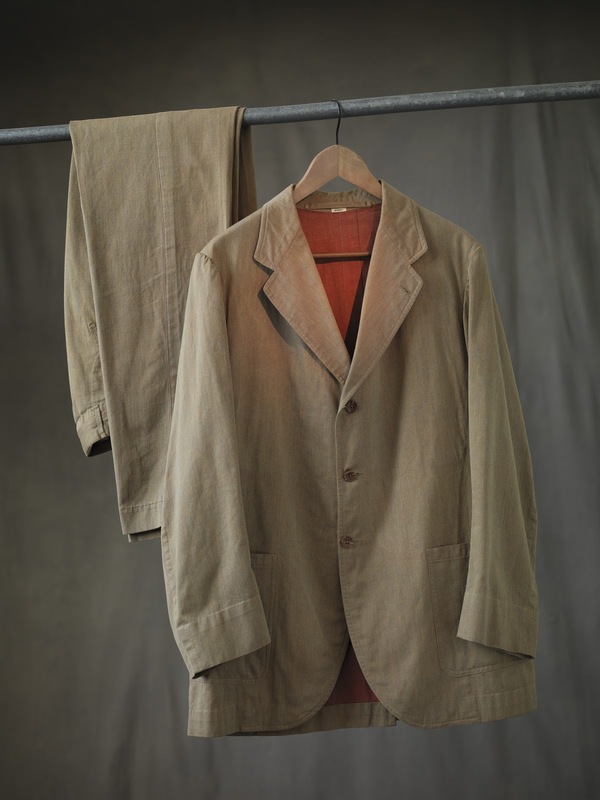 Beginning in April, the Museum of the Rhode Island School of Design in the US will be holding an exhibition of clothing drawn from its archives and borrowed from sources around the world – including our own, inimitable Guy Hills and customers of cutter Kathryn Sargent. I’ve picked out a few interesting pieces from the archives – more contemporary pieces readers will be familiar with. 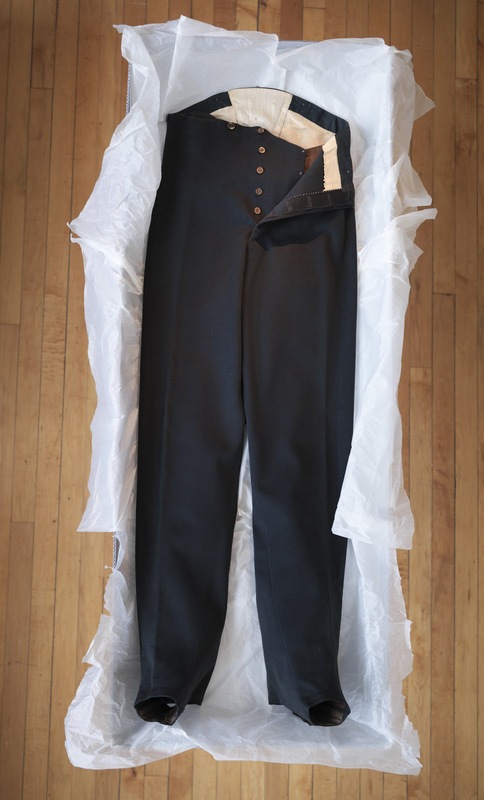 This bespoke suit (above and top) was made for actor and writer Michael Strange (pseudonym of Blanche Oelrichs). Already breaking the mould when she was married to John Barrymore, Strange described the pleasure the couple enjoyed in swapping details of men’s and women’s clothing: “Jack and I dressed in a manner never affected before or since. Pleatings and flutings appeared on his trousers, duplications of the ones on my skirt. 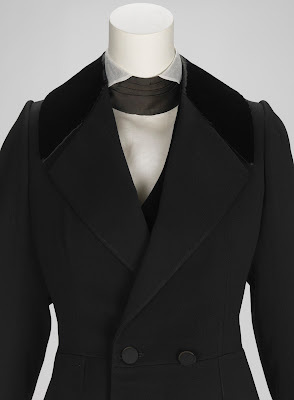 … He considerably lowered his shirt collars, of which I instantly had a dozen copies made.” Strange wore this suit by Brooks Uniform Company in her everyday life and when playing the title role of Napoleon II in L’Aiglon. The suit’s traditional construction is offset by a silk organdy dickie and trompe l’oeil bow tie. 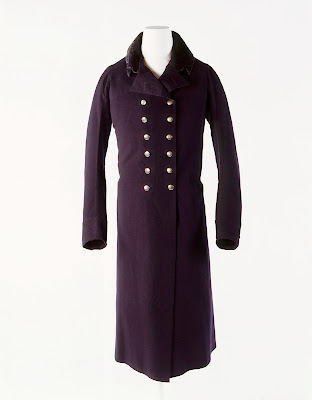 This coat is one of few surviving garments from the age of Beau Brummell’s Regency London. A wool greatcoat from London tailor John Weston, who made for Brummell and George IV, it was deposited in the vaults of Coutts Bank and thus survived over 100 years in pristine condition. An unlined suit worn by WF Whitehouse around 1910 and made by Hoar & Co of Bombay out of a double-cloth cotton. A dandy-explorer, Whitehouse dressed in a manner that constantly reminded people of his adventures to foreign territories. He was a pioneer of free hot-air ballooning and on one trip reached Bombay, where he likely celebrated with the commissioning of this jacket. And a rather exotic banyan worn by George IV when Prince of Wales in the 1780s. A banyan is a quilted and printed robe, cut loosely and used in the same way as a house coat or dressing gown. 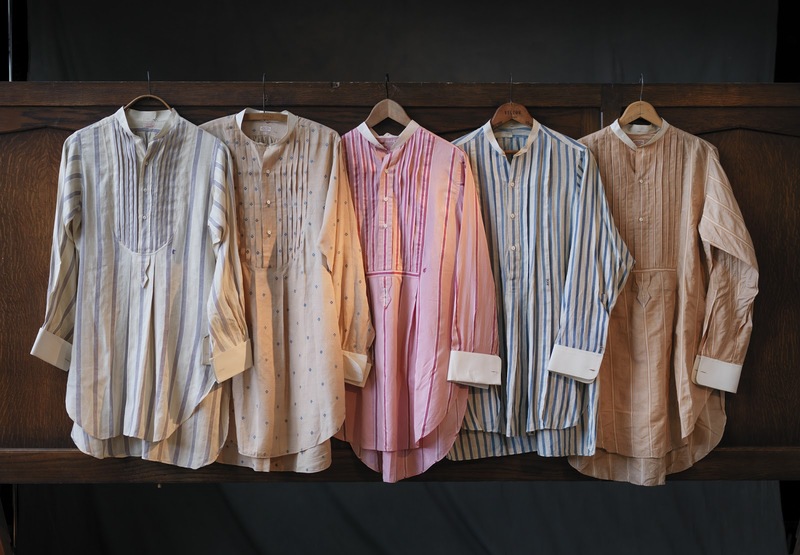 Worn in parts of India and the Middle East. 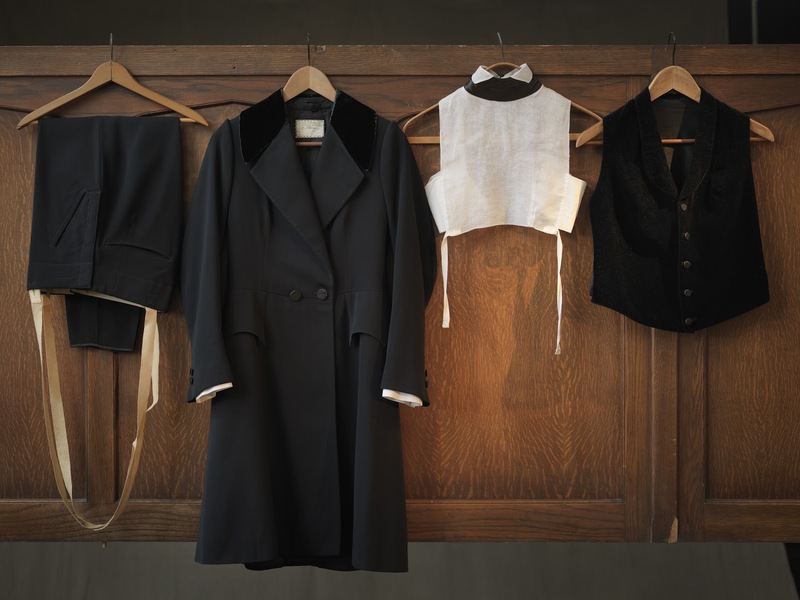 You can follow the discussion on Dandy pieces in RISD Museum exhibition by entering your email address in the box below. You will then receive an email every time a new comment is added. These will also contain a link to a page where you can stop the alerts, and remove all of your related data from the site. In the article, there is a mention of Gieves & Hawkes as offering fully canvassed. That is true… but not for RTW. These are glued/fused. I believe G&H RTW is all half-canvassed. Yes, that what I say in the piece. The comment made above is incorrect. A great article, some more eccentricities please! Would it now be too pretentious to wear a house coat, or even a banyan? I think in the privacy of your own home there is far less of a role for propriety. Wear what you want. 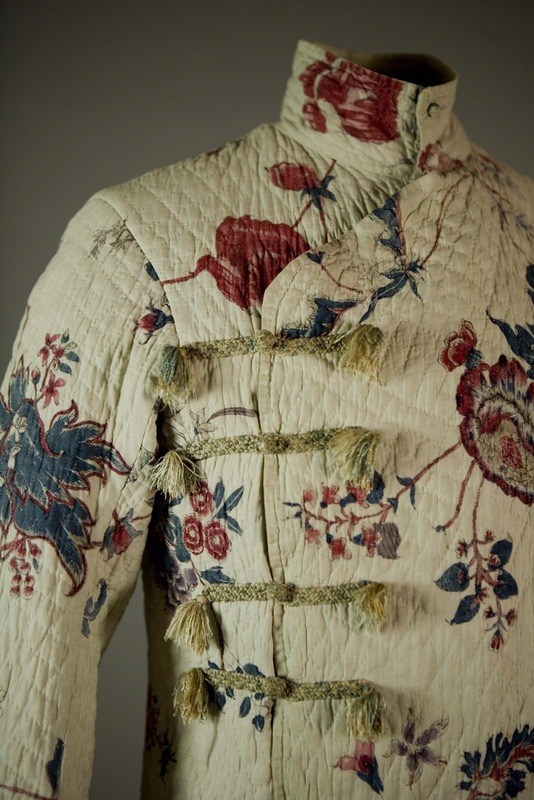 I prefer a flannel dressing gown and my gomminos, but I am really not much of a dandy at heart. No good tailors to recommend in Jodhpur I’m afraid. If you want to buy things look in the shop of the Umaid Bahwan Palace though – they had the best quality weaving, cloth etc of anywhere, and at the same price as the street markets. What a shame, not even worth getting a few cheap shirts made for the cheap price?